I have an excellent REI Cirque ASL 2 tent which tips the scales at just over five lbs. It's perfect for one, it's real cozy for two, and it weighs too much. I used it for winter camping when I was pulling a pulk, and for solo motorcycle camping. At our age, we are interested in packing light to keep our bones and joints from screaming in protest, and started looking for something roomier and lighter. 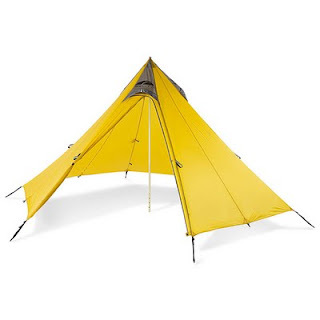 I was attracted to some of the sil-nylon tarp tents made in the US of A by cottage industries supporting the ultralight niche, and found Golite's Shangri-La 3. First thing you learn when looking at tents is that if you're a toss & turning side-sleeper, a "2-Person" tent is really very suitable for one, and a "3-Person" tent is perfect for two. Especially if those two are stuck in it for a few days of sustained nasty weather ... The Shangri-La 3 is a floorless pyramid shaped tent. It weighs 26 ozs if you eliminate the included pole and use an extended hiking pole. At 59 sq ft, and 62 inches high, it is a palace for two. It has a couple of options - A bathtub style floor, which at 19 ozs will work very well during the shoulder seasons when we are concerned with staying dry, but not so much about keeping bugs out. For buggy summer months we got the Shangri-La 3 nest which combines a bathtub floor with mosquite netting. At the heaviest, we'll be packing 3.81 lbs - which we can split between us. Timing was perfect as we managed to get these during a sale, and additional savings coupons could be used. The tent normally goes for $275, but I got her for $81 including shipping. Similar deals were available for the nest and floor. Can't wait to set her up in the back yard! Today is my first day as either retired or unemployed - Again. See, I retired from the Navy, went to work as a federal bureaucrat for awhile, left that job to be with fambly as our folk's health declined. Mary and I sailed our 32' sailboat from the Chesapeake to Michigan, and settled in. After a bit I decided to supplement my meager retirement stipend, and took part-time gig with a brand new big-box hardware store. About the time I was starting to worry about my exit strategy so that I can make this hike, the mucky-mucks at corporate were worrying if this particular store was ever going to be profitable. 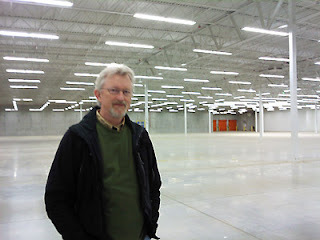 In the end, they decided to close the store that I had helped open just five years ago. I was offered a position in another store, or a severance package, and I accepted the latter. I'm still not sure if I'm finally retired, or just temporarily unemployed, but at least I don't have to worry about my exit strategy. This will allow us to backpack this summer and fall, and to maintain a conditioning routine through the winter. So today, Mary and I put on our hiking clothes and went for a 6 mile walk. She's been doing 3 miles a day for the last week while I've been working, and this was the first long walk I've taken since early winter. We decided to walk to a nearby nature preserve where a geocache was recently hidden. It was 32 degrees with a light wind and sunny when we left, with promises of reaching 40. Sounds like late March in Georgia - except maybe the sunny part. I wore a base layer, a thin fleece and my new Goretex Paclite jacket on top, a base layer and thin nylon hiking pants, a fleece hat and soft-shell gloves. It was near perfect. Mary got a bit overheated, and her lightweight down-filled gloves were too much for her. The trail in the preserve was covered with well-consolidated snow that we could walk on without post-holing. Wool socks with trail-runners were fine. A few joints protested, but that quickly passed. My hip started to bother me a bit towards the end. I'd expect that to just get better with more walking.